As with all ‘Perfect’ tenses in English, the Past Perfect is used to link two times together. Past Perfect specifically joins two finished actions in the past. It is often used to distinguish which action occurred first in a situation. 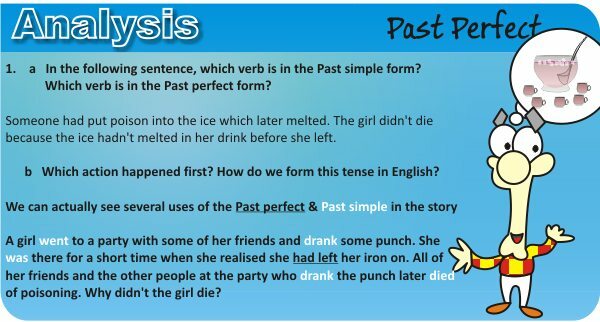 Do some of the exercises below to gain a better understanding of the Past Perfect tense in English. 1) Try to think laterally to answer the following story. A girl went to a party with some of her friends and drank some punch. She was there for a short time when she realised she had left her iron on. All of her friends and the other people at the party who drank the punch later died of poisoning. Why didn’t the girl die? First check the words in bold above in your dictionary and then try to think of a possible solution. Answer – only read after you have tried to solve the problem. Someone had put poison into the ice which later melted. The girl didn’t die because the ice hadn’t melted in her drink before she left. The following is a chronological list of the events at the party which might help to understand why the girld didn’t die. 1) Someone put poison in some water and made ice cubes with it before the party. 2) The poisoned ice cubes were added to the punch at the party. 3) The girl drank a glass of the punch before the ice had melted. 4) The girl’s friends and the other people at the party kept drinking the punch as the ice melted and were therefore poisoned. We use the Past perfect tense in English to link one time in the past with another time further in the past. It’s almost like the ‘past of the past’. It is often used to show which past action happened first, especially when it is unusual or unclear. 2) Complete the following Past perfect sentences with the correct verb forms. 1) Unfortunately, I (not find) my glasses before I (go) to the cinema. 2) I (wake up) late and (miss) my bus. 3) I (go) to Townsville twice before my last visit. 4) I (met) her before, but I couldn’t remember her name. 5) She (watch) the movie recently, but I (not see) it before. Write your answers below and I will correct them for you. Thanks and I hope you enjoyed this mini grammar lesson. 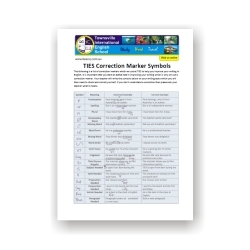 © 2015 Townsville International English School (TIES). All Rights Reserved.